I have had a difficult life, very difficult. When I was a young girl my parents arranged my marriage. My husband was a tailor and he was a very nice person. He behaved very well and I lived with him for ten years. But his family was not like him. It was my fate that I could not become a mother. His family punished me for this. “How long will you stay in our house without having a child?” Without a child I was a servant and slave in the house of my in-laws. I wish that my husband’s family had respected me because I was his wife, but they did not. I served them and helped them all the time, but nobody cared. In order to stay in my own house with them I said to myself, “I have to obey.” I washed their clothes, washed the dishes, and did everybody’s cleaning just to pass my days and nights, just to exist. For ten years I lived like this. But fate would again make me suffer; one day on his way back home from work he was killed in a car accident. I no longer would have him in my life. After my husband’s sudden death, there was no reason to stay with my in-laws, but I had nowhere else to go. My parents were dead and I had no brothers to help me. My brother had gone to Iran to search for a better fortune, and we had not heard word of him since. We did not know if he lived or died. My one sister had died after I was married, leaving me with no close relatives at all. I lived with my in-laws for five years more. Every day I tolerated hardships and every day I had a warning and they would ask me why I still stayed there. One day my brother-in-law told me that I would have to leave the house now. It was evening and I didn’t know what to do. Crying, I left and stayed one night with a friend. But I couldn’t live there. I had a relative in Mazar, so I called him and told him that I was homeless. I had nothing but the clothes that covered my body. My friend paid for my trip to go to Mazar, and now I live with my relative as a servant. I wash the clothes, cook, and clean. I live, but my life passes with such difficulty. I have no one close, no one who cares for me. My relative has sent me to Kabul because I am sick. I have come to Kabul because of my high blood pressure and because of depression. I am depressed because of the life I have led and what I have suffered. In Kabul they say that widows receive a lot of help. This may be true, but I have been here a week and I still need help. But they have bought me new clothes and I have enough food. I am happy here, but I will have to go back to Mazar. My relative called me and asked me if I will come or not because he will find another servant if I don’t. I wish I had a son or a daughter to help me today. I wish I had a family to think about me. Everybody in this world has someone to take care of her, but I don’t have anyone. Maybe I didn’t deserve it. I pray to God and ask God to help me. I don’t ask God to kill me and I don’t kill myself because I know it is not right. You asked me to tell you about my life. I don’t call it “problems.” I tolerate it. It is my fate. 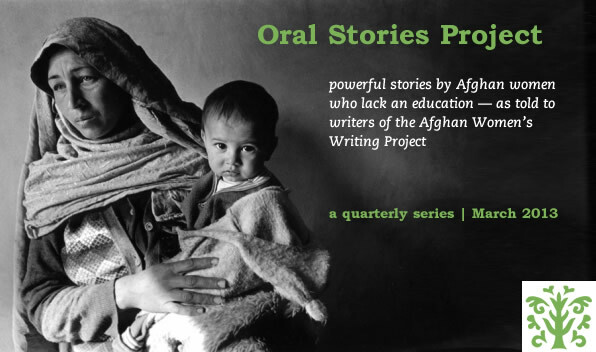 Editor’s note: This story is from an oral interview with Shakila conducted as part of the March 2013 AWWP Oral Stories Project. i am so sorry to hear of this. i will keep you in my prayers that you find happiness and some peace in your life. I understand that the hardships you have faced might lead you to think that you have deserved them and that this is your fate. You did not deserve for any of these things to happen to you. I want you to know that you are not alone. There are people across oceans, like me, who care for you. Although I can’t be with you to comfort you or to help you directly, I feel that I am a sister to you. We are both women in a world that can be very disheartening at times. But, I see your story a little differently. I see your life having a fate that changes other people’s lives. It is beautiful and wonderful that you have shared your story. The courage and strength it takes to have a voice is remarkable, and I can see that this is a part of who you are. Yes, you have experienced very hard times, but I think there are blessings in disguise throughout these hard times. I think that your words have changed people. They have already changed me. I thank you for that. Hi, after reading your story I can understand what you have gone through. Wish that everything in you life can get better. I feel very sorry for what you have lost. Thank you for sharing your story. After reading your story, I understand the hardships you have experienced. Your story will inspire and impact peoples lives such as mine, and I thank you for sharing it. This will encourage and inspire people, especially young women, to become strong and courageous like you. Dear Shakila, My heart goes out to you. You do not deserve to have had such a hard life, I hope that better times will come and you will find happiness in the near future. It is very sad to want to have a child and not to have that opportunity. It sounds like you had a nice husband and I’m sorry to hear of his death. I wish his family had been more like him. I am thinking of you and sending you all good wishes. God did not create women to be ill-treated slaves. This is a misunderstanding. All of creation deserves love and respect simply for the fact that God thought thought you into existence as a necessary part of the whole. I pray that you may find your way to those who love you and value you, that you may discover your own unique talents and find ways to allow them to be used in this world. You contain the whole world within you.